Chelsham Garage, along with other Garages supplied buses to take passengers from Epsom Station to Epsom Downs for the Horse Race Meetings including The Derby, which in those days was always held on a Wednesday in June. This view taken in June 1977 shows the immaculate Chelsham RT 3461 on Route 406F at Epsom Downs. 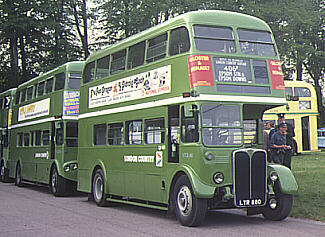 EAST SURREY Open Top Double Deck Bus, PS 137 at The Horseshoe, Warlingham.